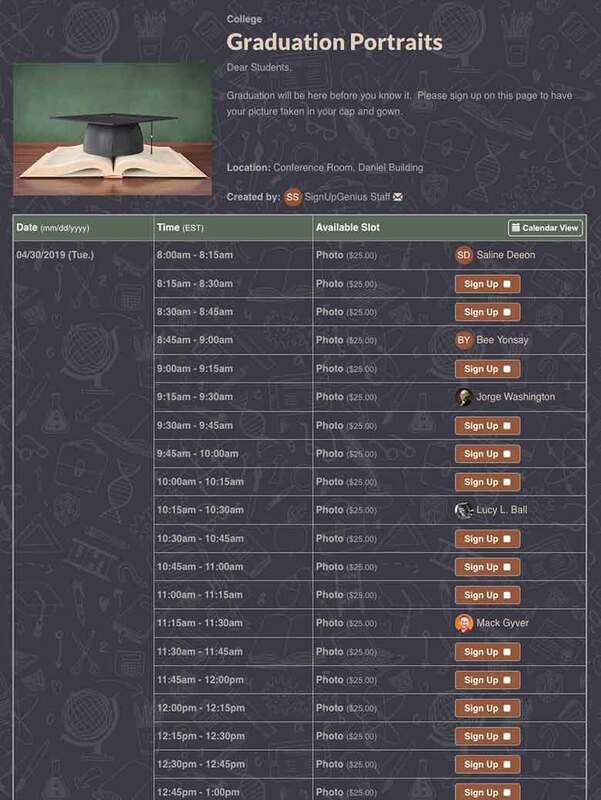 Book photo appointments and collect payments with simple registration software. Build a sign up with our step-by-step wizard to schedule photo sessions and collect money. Payments can be optional or required. Buyers can pay for items with a credit card or debit card. The money will be deposited into the seller's bank account. 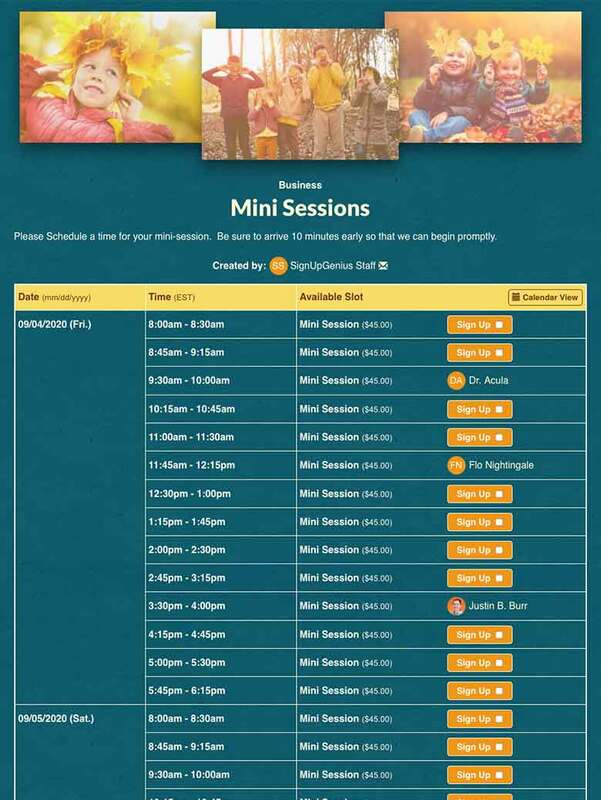 Manage photography sessions for families, weddings and events, and collect payment with an online sign up. Organize photography mini session appointments for family photos, holiday cards, professional headshots and more. Collect money for photography products such as photo books, canvas prints and custom frames with a sign up. 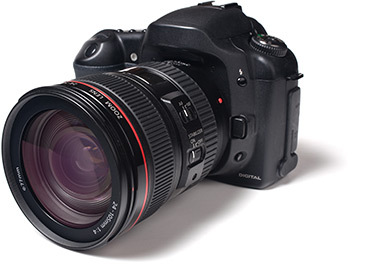 Schedule portrait sessions for senior pictures, graduations, class photos and more. 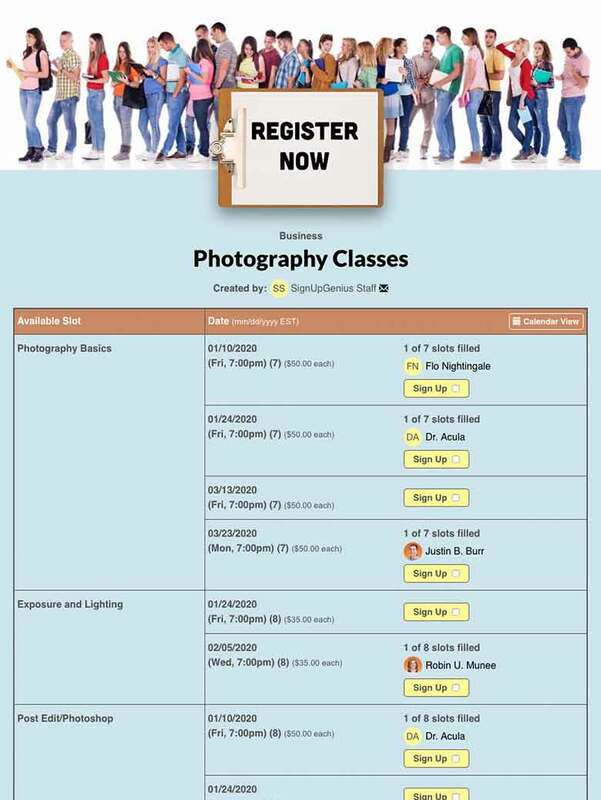 Coordinate photography classes, training and after school clubs. 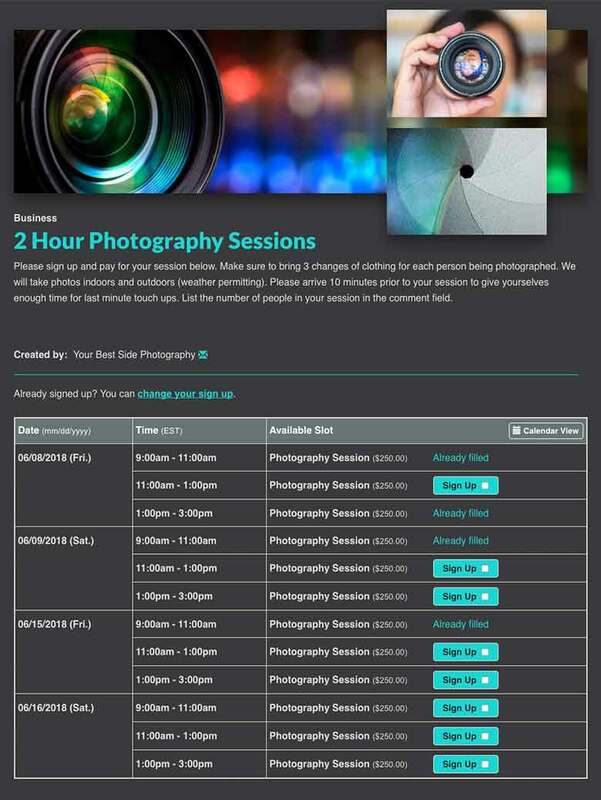 Collect money for photography courses or supplies on an online sign up sheet. 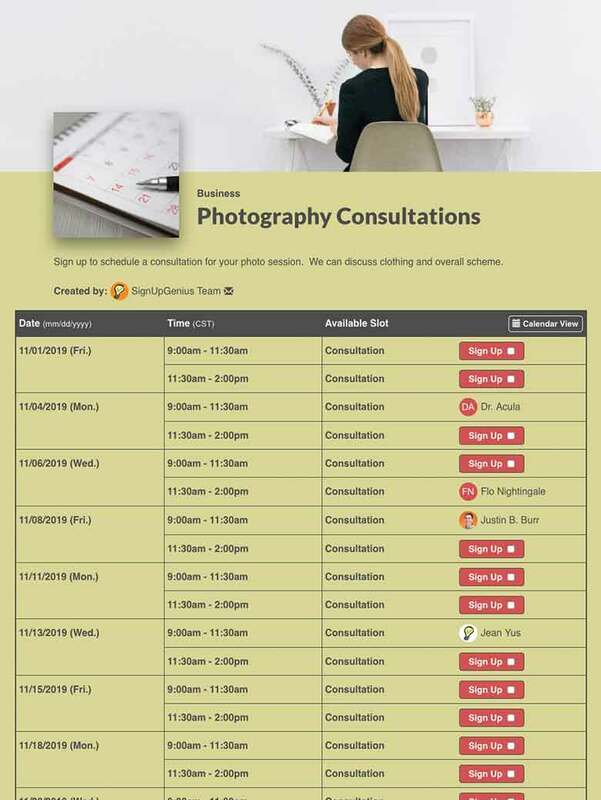 Coordinate and plan client photo consultations and appointments for your business. Buyers do not need to create a SignUpGenius account to make a purchase. 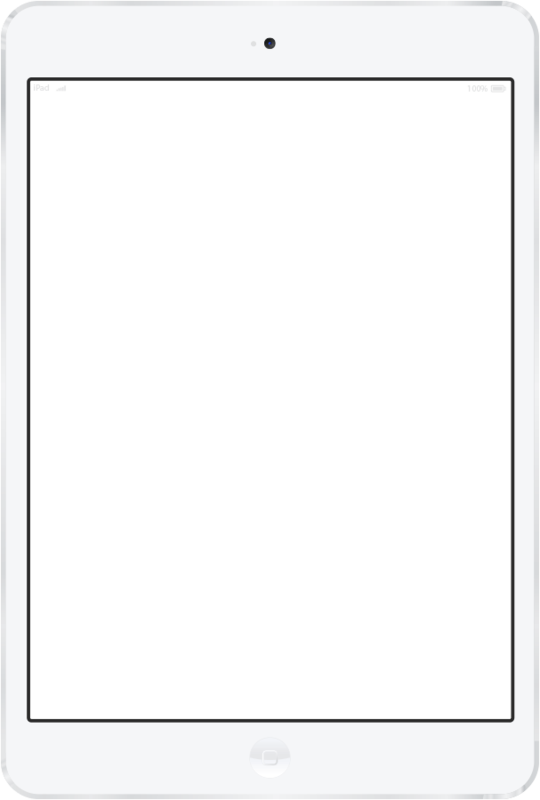 The seller decides whether fees are paid by the buyer or seller. 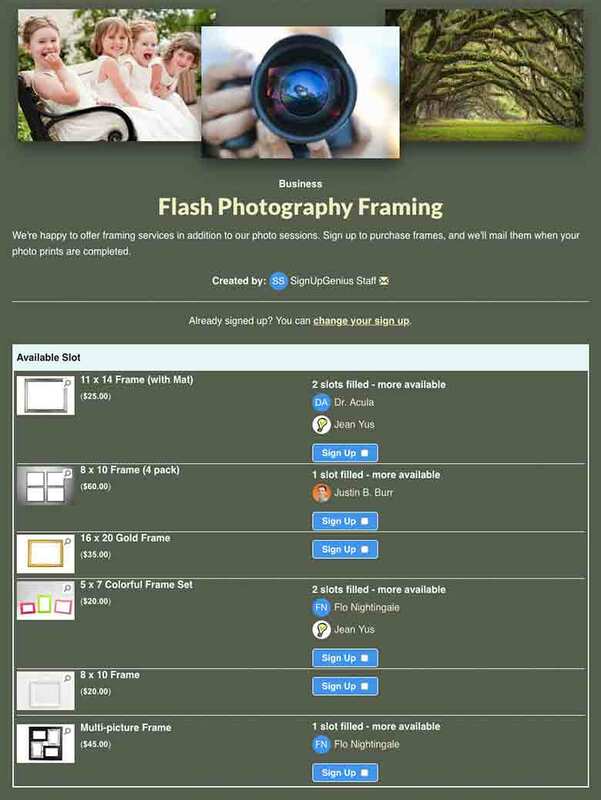 Sellers can add images to sign up slots for product sales. Sellers can set up buyer discounts based on the date or quantity purchased. 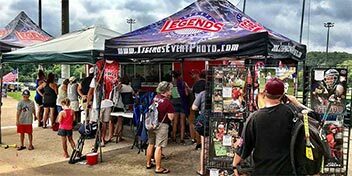 Learn how Legends Event Photo Inc. used SignUpGenius to streamline its sports photography business, improve participation rates and increase revenue. "SignUpGenius has allowed us to offer customers an easy, mobile way to sign up for specific photo services at some of our largest events," says owner Kevin Cook. "In the past, we would typically have to wait until we got on site at an event before we could begin accepting sign ups for some of our photo services. Now, I create the SignUpGenius link and distribute it in a multitude of ways and by the time we arrive on site, I already have a list of customers ready to go!"